We don’t yet live in a world in which a TV show filled with nuanced African-American characters mining mundane events for hilarity might be considered to be—to borrow an oft-cited trope from Seinfeld—“about nothing.” Within America’s peculiar racial calculus, the subtleties of personhood are too easily subsumed by what the presence of an African-American means on screen. Is this character somehow exceptional? Is that one the rule? Is the race movin’ on up or slidin’ on down? A sitcom like the hilarious ABC hit Black-ish, for example, has fun skewering said meanings, but its commentary is a reminder of the status quo, even as it deconstructs it. When that day of awakening finally arrives, however, the FX network’s fall hit Atlanta will no doubt be recognized as some kind of precursor, a sunrise to say: The sky’s the limit. The first season came to a quiet end last night with all eyes on show creator and star Donald Glover, ruminatively walking streets and intersections immortalized by the Georgia-bred hip-hop duo OutKast. (Their pre-mainstream autobiographical track “Elevators (Me & You)” is the episode’s outro.) Glover isn’t actually from these streets, but his show’s comfort with the strivers in them is palpable enough to let us know he grew up just a neighboring congressional district away. Glover’s character Earnest Marks (“Earn” for short, quite pointedly, doesn’t do much of it) is at the center of a world where the laughs aren’t as hard to come by as TV’s prevailing middle-class expectations would have us believe. In a season of sometimes uproariously surreal comedy leavened by an equally steady stream of reality checks, the 10 episodes encourage the kind of rumination only possible when characters come with well-formulated inner lives—to say nothing of actors equipped to illuminate them. ‘Atlanta’ is informed by the different strands of Donald Glover's talent: comedy, music, and writing. Atlanta is probably most informed by yet another side of Glover’s career, the part in which he’s self-released several acclaimed mixtapes, two albums on a bona fide record label (one yielded two Grammy nominations), and several inventively creative videos as the rapper Childish Gambino. His alter-ego’s clever rhymes and electro-beats may not get him played in a ’hood like the one on the show, but Childish Gambino’s following is so strong that he was able to lure thousands to a Labor Day Weekend camp-out in Joshua Tree National Park to sample Pharos, his forthcoming, shrouded-in-secrecy, release. In the series, Earn’s proximity to hip-hop is among the show’s driving forces. He’s at sea in his hometown, having mysteriously dropped out of Princeton and reentered into a tender but tenuous relationship with his infant child’s mother (a schoolteacher played by Zazie Beetz) before imagining a brighter future managing his cousin Alfred, a burly small-time weed dealer who’s tasting local fame as a mixtape star named Paper Boi. “When [Earn] wants to do something, he does it—on his terms,” says Earn’s father to convince Paper Boi to give his son the opportunity, mustering pride even though we’ve already learned that, tough-love style, Earn is currently unwelcome back in his parents’ home. As played by Brian Tyree Henry, Paper Boi is a smart, thoughtful guy trapped in a thug-associated exterior, something few will let him forget as Earn gets him booked on interview shows, in charity basketball games, and the like. He’s the player who seems to need the game a bit more than he actually loves it, which might explain why throughout much of the season his entourage tops out at two: Darius, his spaced-out roommate/henchman/sidekick (a breakout role for Lakeith Stanfield), and Earn. Though the surrealist look and feel of Atlanta mirrors the style glimpsed in Childish Gambino music videos, shot by the series’ key director Hiro Murai, there’s actually another source that suggests Glover had this particular brand of anti-storytelling in mind a little earlier. It’s interesting to compare Atlanta’s unbusy, long shots and clever narrative digressions with those in the short film Clapping For the Wrong Reasons, the Glover-Murai collaboration that preceded their music videos. The most obvious difference is location. Instead of the working-class homes, shopping strips, and fast-food alleys of metro Atlanta, the short’s action takes place in LA luxury; a group of pretty young things and music folk, including Glover and phenom Chance the Rapper, are chilling in a rambling home replete with cliff-side swimming pool and a garden with fresh lemon trees. When one of the young guys tells a bonfire tale of adolescent pranks escalating beyond control with the philosophical summation, “Sometimes you can’t explain why things happen. 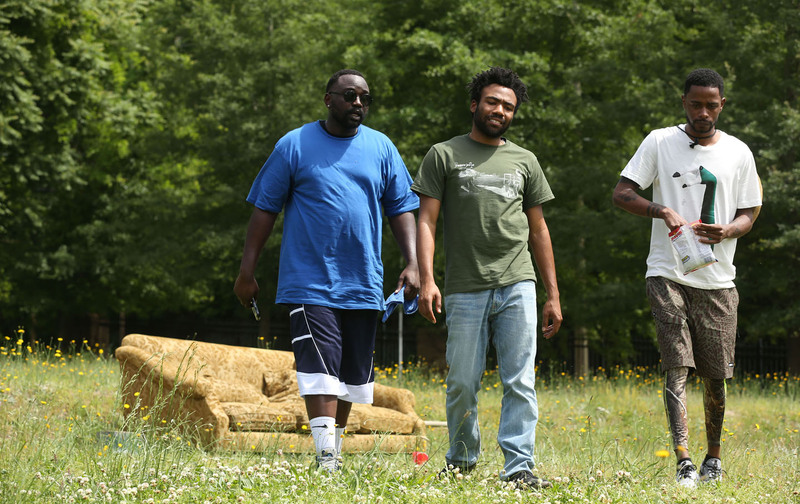 They just do,” it’s impossible not to hear him as the harbinger of a number of Atlanta’s striking tableaus, from the altercation in the pilot that leads to a rivetingly comic jailhouse scene, to last night’s finale, which comes off upbeat (will the boys hit the road on a tour next season?) despite coming clean about the stark reality of Earn’s living situation. Audiences have also come to understand why Vanessa, the mother of Earn’s daughter and friend of the black bourgeois set, is clear-eyed and independent-minded enough to stand by him. FX broke with convention and ordered a second season of Atlanta just a few episodes into this one, so they’ve long since realized that viewers were willing to watch this vibrant crew do a whole lot of sweet, sweet nothing.